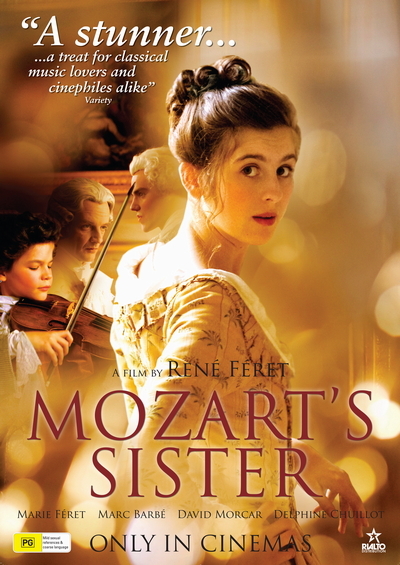 Story: Beginning in 1763, it follows the Mozart family's exhausting life on the road, traveling by coach from one royal court to the next, where the nobility marvel at young Wolfgang's prodigious talent. But accomplished singer, harpsichordist, violinist Nannerl, Wolfgang's elder by five years, first held forth as the family's infant prodigy. At the film begins, she is still performing, though overshadowed and sidelined as accompanist by Wolfgang's growing fame. Her father bows to social strictures "for her own good," refusing to let her continue with the violin or compose, while privately conceding Nannerl's talent to his wife. No longer a precocious tot, Nannerl chafes at the limitations imposed by her gender and frets about her prospects.